[Anandtech]: GlobalFoundries Stops All 7nm Development !! I am a little shocked to say the least. I expected more problems at 7nm than most people, but I didn't expect GF to throw in the towel. I wonder what designs AMD had at GF, and how much of hiccup there will be transitioning to TSMC. So AMD's 7nm is actually TSMC only. That's quite the twist. none, apparently. I guess this is why they signed on with TSMC some ~year ago for their first 7nm parts, and negotiated better pricing for their non-GF orders. I would think that this is great news for AMD because it means that they can further renegotiate their wafer order and cost to go outside of GF, but I wonder if this was something that was already baked-in to last year? The article suggests that GF is talking with their current partners, primarily AMD, to discuss this, so maybe there is more to look forward to. This could turn out to be pretty significant. Yeah, I understood only that their first 7nm parts would be TSMC, with plans to expand later to GF with more capacity...but it's looking permanent. I'm thinking there was uncertainty between the two regarding GF's 7nm, going back however long, hence the agreement to start on TSMC. ...Not sure if this really will be that great for AMD now that I think about it: this means there is less capacity for 7nm. Hope this doesn't mean real shortages when the first consumer 7nm GPUs start shipping. It also means they are on even footing with NVidia for process tech going forward. It was sometimes argued, that recent NVidia GPUs had a clockspeed edge because of better process tech at TSMC. Looks like GF will be irrelevent anyway. 7nm AMD products start shipping this year. Holy...that's quite the news. And that cannot be good for GF, pouring billions in and then giving up on it about the time they were ready to start moving to production. Either they had serious issues that couldn't be overcome, or they're about to be run into the ground by profit above all shareholders that can't think beyond the next few quarters. While I'm sure AMD will be glad that this would seemingly end their wafer deal, I can't imagine AMD is super pleased that they lost an option for production. This means they're going to have to compete with Nvidia, Apple, and many others for production, and AMD does not have the same resources as those others. Now, maybe TSMC won't be too constrained for it to cause problems, but that also means they'll be feeling less pressure to remain competitive and that isn't a good thing for the whole industry. Hopefully Samsung will be competitive. That would explain why AMD was aggressive in going after TSMC 7nm. I'm sure they were aware that GF was having issues. I was pretty surprised finding out that both Zen 2 and Vega 20 were TSMC (I actually kinda figured the latter would be, with GF probably handling the smaller Polaris level GPU chips, but Zen 2 EPYC being TSMC was pretty big news I thought, and I guess a harbinger). This might also explain that there was talk that APUs might not move to 7nm quickly. Oh, and I think Sony and Microsoft have TSMC fab there, so AMD is potentially going to be competing against partners for production capacity (but it could be beneficial in that they hopefully will get info/data from them to help with their own production). This could be a big opening for Intel if they want to open their fabs more. Based on Fabs projected to make profit: Dresden and Chengdu. It is odd to continue support for FinFETs, rather than not cancel 14LPP/12LP for heavy-handed 12FDX support. With the future of FinFETs/Stacked Nanosheet on haitus, it is time to get that sweet sweet UTBB/Planar Nanosheet FDSOI dough. AMD seems prepared, their speedy Zen roadmap builds primarily onto TMSC's node progress already. The Zen 1/2/3 timeline always seemed highly optimistic based on GloFo's performance, but TSMC is highly reliable with their planning. I'm more curious about IBM, 7nm at GloFo would have been the first node enabled by the former IMB R&D staff moved to GloFo. That seems to be no more. GloFlo have always been behind the pack, I am not surprised they have given up. The expensive part is development, continuing production on a node that already exists and works is pure profit. No way are they canceling that, even if they decide they don't intend to develop it further. In case you did not understand the announcement: GloFo is bowing out of the high-end. All the product lines they intend to develop further are about things that are not high end CPUs or GPUs. There will be no glorious future of FDSOI CPUs. GlobalFoundries has no deals with FinFETs only FDSOI. The only node GlobalFoundries has already projected profits(no loss) from is 22FDX. (quote)14-nm and 12-nm FinFET processes for radio-frequency, embedded memory, and low-power customers. GlobalFoundries is doing Ultra High Performance only on 22FDX/12FDX. No high performance for FinFETs. Pretty sure, 7FDX when announced will wreck every node down to 4-nm Stacked Nanosheets. GlobalFoundries has only broke up with the FinFET division. What isn't said is that the CEA-Leti/STMicro (FDSOI) division is getting the money that went for the FinFET division. Unlike FinFETs, FDSOI needs no physical optimization for high performance or low power. Taller Fins, its planar, Shorter square fins, its planar, need doping, nope have body biasing. AMD is still obligated to buy an increasing amount of wafers from GloFo, and pay money to GloFo for every wafer they produce at third parties, according to the WSA, which hasn't been cancelled, or amended, or brought to court, yet. If they have some agreement on ending the WSA, they should make that public (SEC filing), otherwise I would assume AMD is paying a lot of money to GloFo for nothing. We have a wafer supply agreement with GF with obligations to purchase all of our microprocessor and APU product requirements, and a certain portion of our GPU product requirements from GF, with limited exceptions. If GF is not able to satisfy our manufacturing requirements, our business could be adversely impacted. The WSA governs the terms by which we purchase products manufactured by GF. The WSA is in place until 2024. Pursuant to the WSA, we are required to purchase all of our microprocessor and APU product requirements, and a portion of our GPU product requirements from GF with limited exceptions. If GF is unable to achieve anticipated manufacturing yields, remain competitive using or implementing advanced leading-edge process technologies needed to manufacture future generations of our products, manufacture our products on a timely basis at competitive prices or meet our capacity requirements, then we may experience delays in product launches, supply shortages for certain products or increased costs and our business could be materially adversely affected. Moreover, if GF is unable to satisfy our manufacturing requirements and we are unable to secure from GF additional exceptions allowing us to contract with another wafer foundry to satisfy those requirements, then our business could be materially adversely affected. In August 2016, we entered into the sixth amendment to the WSA with GF (the Sixth Amendment) pursuant to which we agreed to certain annual wafer purchase targets through 2020, and if we fail to meet the agreed wafer purchase target during a calendar year we will be required to pay to GF a portion of the difference between our actual wafer purchases and the applicable annual purchase target. If our actual wafer requirements are less than the number of wafers required to meet the applicable annual wafer purchase target, we could have excess inventory or higher inventory unit costs, both of which may adversely impact our gross margin and our results of operations. 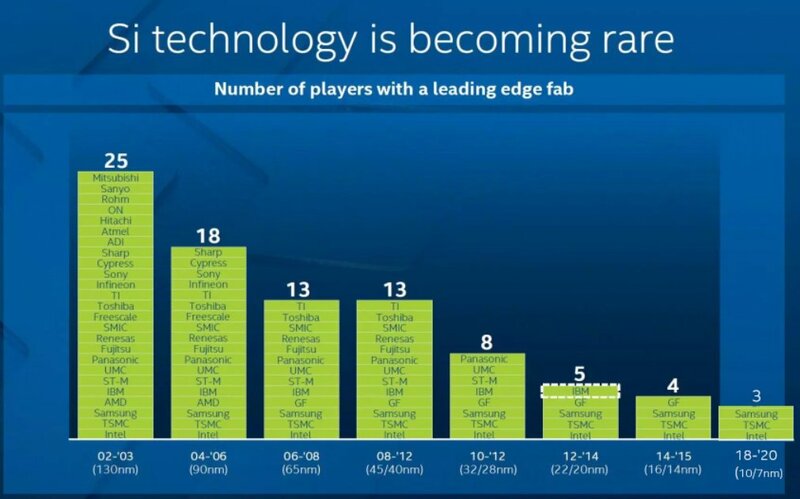 As a result of TSMC being the only vendor for 7nm in the near future, capacities will be limited and divided on too many customers, AMD, NVIDIA, Apple and others. So AMD will prioritize their 7nm share on Zen2, and some Vega Instincts as pipe cleaners and that's it. Navi will get the shaft till capacities become plentiful and production costs reasonable. If anyone is going to be 'getting the shaft', i'd guess it would be nvidia. And there isn't even a hint of any activity from them on 7nm. I wouldn't be surprised if we don't see any nvidia products on 7nm in 2019. I'm assuming this means that AMD won't have to pay the WSA tax for any of their 7nm wafers at TSMC. They pretty obviously skipped whatever they would have released for Tesla this year in favor of 7 nm products next year. You are so far off the mark man. NVIDIA created a custom 12nm node with TSMC, you think they ignore 7nm just like that? They have a deep and old partnership with TSMC, much stronger than AMD. And they ship more products, So TSMC gives them priority. Just like Apple. If Nvidia knew they were jumping onto 7NM in the near future,they would not have invested so much dosh into developing an optimised 16NM node which can make massive chips,and it hints that Nvidia was of the opinion they would not be shrinking their GPUs anytime soon. This as GloFo have changed the conditions by abandoning 7NM,5NM and 3NM. If Nvidia knew they were jumping onto 7NM in the near future,they would not have invested so much dosh into developing an optimised 16NM node which can make massive chips,and hints that Nvidia was of the opinion they would not be shrinking their GPUs anytime soon. Agreed. And AMD has historically been first to market with a GPU on a new node from TSMC, while nvidia's attempt prior to 16nm was the disastrous Fermi. They haven't even launched 12nm (optimized 16nm), i doubt they'll be taping out anything on 7nm until the first part of next year. Especially with wafer supply ramping and multiple companies ahead of them eating up available wafers. I don't think those made sense to begin with, which is why AMD has gone to a tick-tock (even if they call it something else). This way they extend things out to 6 years instead of 3. A few months back when they did that article and didn't even mention the 7nm HP (or whatever, the one that was usually what IBM went for on the Power chips), and I think said straight up they only had one 7nm process they were working on I thought that was weird and wondered what happened (since it sounded like buying IBM's stuff was aiming right at that, and they had been focused on developing that almost the whole time since GF got them). Now we see why that was. I'd think why not just divest that group then, sell it off to someone so that you get money from the sale and let them try to get the process working. Surely Samsung would've been interested. GlobalFoundries has no deals with FinFETs only FDSOI. The only node GlobalFoundries has already projected profits(no loss) from is 22FDX. (quote)14-nm and 12-nm FinFET processes for radio-frequency, embedded memory, and low-power customers. You're missing or ignoring that was paired with "low power and relatively low cost" as in its products that meet all of those things. Plus you're ignoring that they're talking about completely different types of chips with regards to that as well (the "RF, analog, or mixed-signal"). They're trying to become the cutting edge place for chips that used to go on nodes generation or more back (where cost was the biggest factor). They're getting out of bleeding edge high performance processor production entirely. I don't think AMD is going to make designs targeting GF's processes beyond the 14/12nm nodes they're already using. We'll see. I cannot fathom AMD not throwing a huge fit if GF tries to make them uphold the agreement. And in the meantime go to OEMs and see if they'd be interesting in taking a bunch of Polaris and Zen 1 (maybe cut them to 4 cores or something they don't cannabalize Zen 2) chips for basically the cost of production (and they can do whatever with them, slap them both on boards with some memory and sell them as cheap systems, maybe see if Valve could make a new Steambox from them and let Valve develop Linux support), just so that it'll eat some of the wafers while AMD probably has to sort out the deal through the courts if it comes to that. Or maybe flood the HPC market with Vega chips to try and get some market share from Nvidia. I don't see that happening. Nvidia has more money and they already worked a deal for their own custom version of 12nm, so Nvidia and TSMC have a good relationship. I wonder if this could mean we see AMD practically leave the consumer dGPU market and maybe even ditch consumer APUs, in order to allocate the production capacity they can get towards more profitable/revenue generating chips. Unless they have something in the works to produce some at Intel or something crazy like that (like Intel wanting to get experience in making GPUs on their process takes AMD GPU while they get theirs up and running, but for as short lived as that would be I don't see it happening). But with Intel's 10nm problems I don't know that that'd even work, and Intel isn't gonna let them on their next node to give their own GPU an advantage. We'll see, that would definitely help them. That might help explain things (I'm guessing Nvidia really didn't want to be selling consumer chips that are as big as Turing is). AMD must've said "whatever it costs" to get priority on 7nm. I9 9900k Official Reviews from Anandtech, Tomshardware. Add your own links to others !